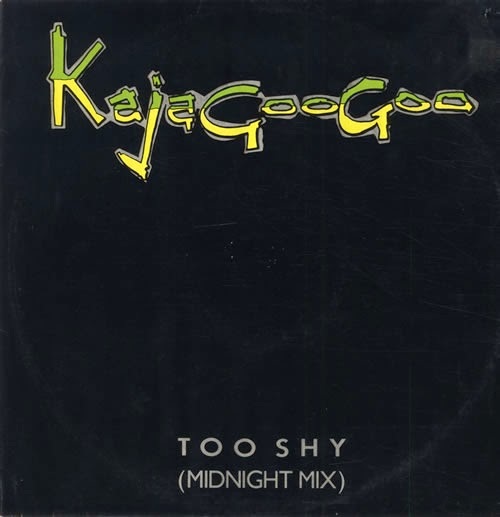 Home / 12 inch single / Kajagoogoo / MTV / Music / VH1 / 80s Timeworn Twelves: "Too Shy"
80s Timeworn Twelves: "Too Shy"
Kajagoogoo's "Too Shy" is widely known as a one hit wonder in the US, ranking 9th on VH1's 100 Greatest One Hit Wonders of the 80s. In 1983, the debut single reached #5 in the US and #1 in the UK for two weeks, benefiting from heavy airplay on MTV. EMI released a 12" Midnight Mix single, a remixed version adding almost 2 minutes compared to the White Feathers album version. The B side featured an unreleased track "Take Another View" which was often included in live sets. Kajagoogoo would reach the top 15 in the UK with their next three singles, but would have no further success in the US. Click below to hear the 12" extended "Midnight Mix"of "Too Shy"